Tens of thousands of people pulled on their running shoes and sweated their way through the annual London marathon yesterday, including a number of celebrities who were competing for charity. 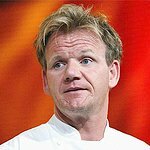 Celebrity chef Gordon Ramsay was one of many who lined up at the start for his 10th time at the event. He ran once again for the Scottish Spina Bifida Association, an organization that supports, listens to and helps children, adults and families with spina bifida, hydrocephalus and related conditions. Also competing were British model Katie Price and husband Peter André, who ran for children’s charity Vision and the National Society for the Prevention of Cruelty to Children. Other celebrities to take part included Boyzone singers Keith Duffy, who ran for autism awareness, and Ronan Keating – who ran for Cancer Research UK – as well as British cyclist Chris Boardman, who won gold in the 1992 Olympics and ran for The National Autistic Society, and weather girl Isobel Lang and 2002 Big Brother winner Kate Lawler, who competed for Cancer Research UK. Last year’s event raised £46.7 million for charity.